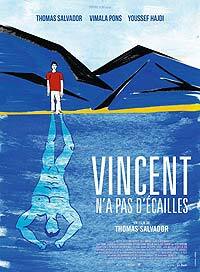 Vincent n'a pas d'écailles (2014) - Sci-fi-central.com. France  2014  78m   Directed by: Thomas Salvador.  Starring: Thomas Salvador, Vimala Pons, Youssef Hajdi, Nicolas Jaillet, Nina Meurisse, Rémy Ventura, Philippe Xiberras, Claude Maurice, Simon Espigue, Amandine Rigaud, Tom Sebban, Najim El Atouani, David Grolleau.. I'm a big fan of the superhero genre and as a matter of act, while lovingly eating each slice of the MCU cake, I've always been curious to discover flicks of all kinds from all over the world. Unfortunately that's why I found myself watching Ra.One, uh! Alongside USA and Japan, France is a land with a strong superhero culture. French males in their late 30s and their 40s grew up reading Strange and Nova, monthly magazines that then compiled the adventures of Spider-Man, Alpha Flight, The Avengers and so on. Nowadays, France is the second world market for mangas. You just have to go to a FNAC at the comic book shelves to see zombified manga buffs spending a 10am to 7pm day reading their favorite series. Therefore how can one not be curious about the self-proclaimed "First French Superhero Movie?" Moreover the trailer is more of a teaser that looks funny and says nothing about the plot. That's how I ended up at the movie theater in a not that empty room, looking forward to this intriguing flick. Surprisingly it's not a comedy let alone a spoof. Vincent is a discreet shy Average Marcel. In a world of the quest for easy fame, he only wants to live his normal life. The film starts with any other French film, with a solitary guy looking for a job. The first act respects its French origin. Dialogue sounds extremely natural and then unwritten. You have a feeling to be in your everyday life as boring as it may be. Plus the very good thing is it's a no-star cast. Big trouble in Little France is that you always see the same faces in movies. The lead actor is a boy next door and not a star that had spent hours of workout with a coach to look toned. The actress is pretty without being a bombshell. Even the photography is typically French. Meaning it looks all but sophisticated with natural lighting. All of this sounds off-putting but actually it ends up being highly refreshing. It is because you know after this "boring" everyday slice of life there is some superhero stuff. Once the first super demonstrations pop up the audience laughs because even though you knew it, you were so plunged deep into the normal life in Southern France it is still a surprise. You laugh yes but the film takes the genre very seriously. I don't know whether the author is a Marvel fan but he respects the genre without xeroxing what was made before while not doing too much. He manages to keep a balance between drama, romance, comedy and superhero and he loves his characters. And you know what? SFX are awesome. No massive destructions, no 15-ft alien monster, just superpowers used in a normal environment. But don't be mistaken, there are walls and cars destructions, chases in the city, rumbles. Every now and then, the author cleverly spreads winks to whisper "Hey man it's a superhero movie!" Of course the movie has flaws. Thomas Salvador is not Matthew Vaughn. Vaughn is "I'm the best of the best and I'm gonna demonstrate it with high virtuosity." Salvador is exactly like his character, a bit too shy and too hesitating at times (but when needed he kinda rocks). The music though funny sounds like stolen from a Marriott elevator compilation. With its flaws and its qualities, the movie is very original and respectful. Plus without saying too much the ending is just perfect. For Marvel fans and people who aren't into superheroes, because it's a refreshing change with a drastically original tone for this genre, this film is definitely a high recommend. Review by Chris Rakotomamonjy from the Internet Movie Database.